The Brother ADS-3600W offers true wireless connectivity so there is no need to log on to a central PC or install software at multiple location points. Share information across teams and departments with minimum user involvement. Featuring fast, high quality 2-Sided scanning, the ADS-3600W offers improved performance and image processing with Kofax compatibility. Enhanced scan features include NFC Technology (Near Field Communication) which automatically establishes a direct connection between your NFC enabled smartphone or tablet and an NFC scanner device, scan directly to your smartphone or tablet with the iPrint&Scan app (available on Apple & Android) and Outline and scan will only scan areas outlined in red pen. Scan to USB flash memory drives, cloud scanning allows documents to be scanned directly to cloud based programmes such as Evernote, Dropbox and Google Drive. Also scan to E-mails along with OCR scanning direct to Microsoft Word, Excel & PowerPoint. 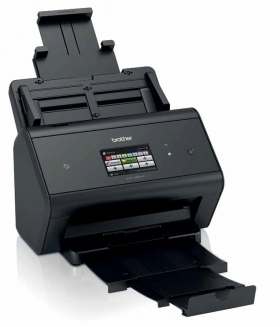 Scan up to 50 pages per minute colour and mono, automatic 2-sided scanning, up to 600 x 600dpi optical scan resolution and a interpolated scan resolution of 1200 x 1200 dpi.